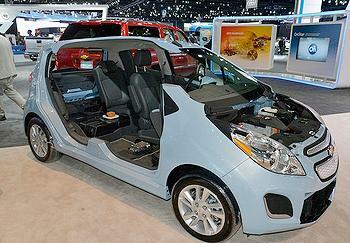 LOS ANGELES, California, November 30, 2012 (ENS) – Chevrolet’s first pure electric vehicle, the Spark EV, was unveiled Wednesday at the Los Angeles Auto Show. But unlike the Volt, which is a hybrid, the Spark EV draws its power from an advanced lithium-ion battery pack, rated at more than 20 kWh. The electric drive unit was designed by General Motors and will be built in the GM Baltimore, Maryland transmission plant starting in early 2013. Spark EV’s driving force is an oil-cooled, permanent magnet motor that enables the car to produce an estimated 100 kW or 130 horsepower of peak power with instantaneous torque of 400 pound-feet. Drivers can charge the Spark’s battery on a standard 120-volt household outlet, or on a dedicated 240-volt charger. The Spark EV incorporates Siri, Apple’s voice assistant feature for the iPhone, iPad and iPod Touch. Chevrolet said the Spark EV works with iPhone 5 and iPhone 4S devices to integrate Siri through the car’s MyLink radio feature. The Spark EV has two seven-inch LCD screens used to display the vehicle’s functions. “When our team set out to develop the propulsion system for Spark EV, we knew we had to provide surprising fun-to-drive acceleration with maximum efficiency,” said Spark EV Chief Engineer Chuck Russell. 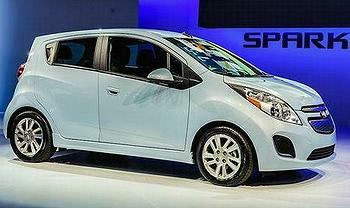 Chevrolet will be selling the Spark EV in California starting this summer. The new EV also will be available in Oregon, and in South Korea, Canada and other global markets to be announced. The Los Angeles Auto Show, the first major auto show of the season,opened to the public today and will run through December 9 at the Los Angeles Convention Center.